Last week I attended (and presented at) the Øredev conference in Malmö. 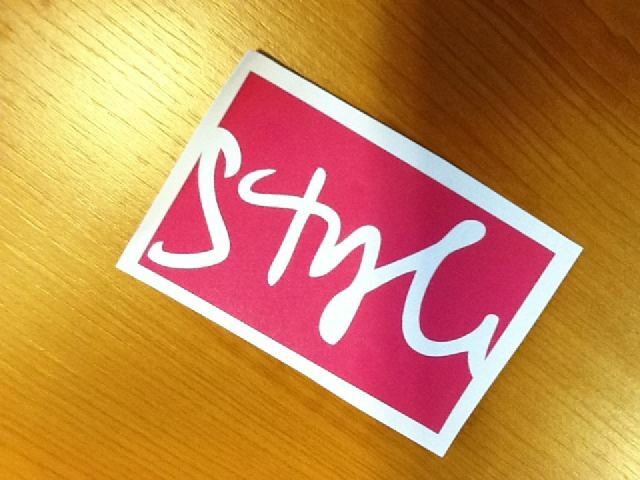 Sigge Birgisson invited me to be part of a fully Context-driven test track, which I gratefully accepted. It turned out to be quite a memorable experience. Øredev was the first ever *developer* conference (be it with a testing twist) I attended, which gave the event a totally different vibe for me. Cosy, laid back and open-minded. Geeky too, in a good way: they provided a cool conference app with a puzzle that could only be solved by obtaining other people’s codes. The side effect of that was that random people started addressing me with “Hi. Can I have your code?” moments before bolting off in their own space-time continuum. Speed dating for techies. Another thing that really stood out were the graphic live-recordings by Heather and Nora from Imagethink. These talented ladies recorded every keynote live on stage, and made the beautifully looking artworks available as handouts later on. A brilliant idea. Day 1 had no real testing track, but there was enough fun to be had in other areas of the development spectrum. As the conference was centered around “the user” (Enter Userverse), it kicked off with “Only your mom wants to use your website”, an entertaining keynote by Alexis Ohanian, of Reddit and Hipmunk fame. Hey, the guy even spoke at TED about a whale called Mister Splashy Pants – top that! This time he told a compelling story about how the secret behind succesful websites is caring for your users. He told us that generally, the bar on websites is raised so low that it is really easy to stand out if you’re able to delight your user. In “Collaboration by better understanding yourself”, Pat Kua stated that people have lots of in built reactions that hold us back from collaborating more effectively: power distance, physical distance, titles, even clothes. What could help us? Awareness, feedback, breaking the cycle, XP practices, courage. A good talk with good content, and some good book recommendations as well. Johanna Rothman managed to keep me engaged for her whole talk about “Managing for collaboration”. She talked about how to manage the entire system for success, and how we should optimize and collaborate on the highest level, solving problems for the entire organization, not the project. I had the privilige of getting to know Johanna in her may 2011 PSL (Problem Solving Leadership) class, which she organizes together with Esther Derby and Jerry Weinberg. I knew she was a great storyteller, and she did not let us down: one gem was how she upset management by donating her entire bonus to her team and letting them decide who got what. Neal Ford closed off the day conference with “Abstraction distractions”, in which he dissected abstractions that have become so common that we started mistaking them for the real thing. An abstraction is a simplification of something much more complicated that is going on under the covers. As it turns out, a lot of computer programming consists of building abstractions. A file system, for instance, is a way to pretend that a hard drive isn’t really a bunch of spinning magnetic platters that can store bits at certain locations, but rather a hierarchical system of folders. And what’s that icon on a save button again? A floppy what? In addition, we shouldn’t name things that expose the underlying details. Users really don’t want save buttons, they just want their stuff to be saved. He also quoted Joel Spolsky’s Law of Leaky Abstractions: All non-trivial abstractions, to some degree, are leaky. The day ended with drinks, dinner and some live jazz. I ended up talking testing (among other things) with Pradeep Soundarajan over dinner, when suddenly a late night evening session was announced: Copenhagen Suborbitals. At that moment, it reeked of a mediocre techno-act from the late nineties and I didn’t really feel like joining in. But Pradeep was curious enough and I decided to tag along. Flash forward one hour. Pradeep and I were literally blown away by a passionate tale of two Danes with a dream to build and launch their own manned rocket into space. Peter Madsen told a compelling and inspiring story about dreams, constraints, possibilities, enthusiasm, courage and rocket fuel. Day two was kicked off by Dan North who talked about “embracing uncertainty”. Fear – he said – leads to risk, risk leads to process, process leads to hate… and suffering and Gantt charts. Dan stressed that people would rather be wrong than uncertain, and that adding more process in times of uncertainty is wasteful and counter-productive. He also contrasted the original intentions of the agile manifesto in 2001, and what has become of that now. He stated that our ability to survive is directly related to handling the unexpected. We should embrace uncertainty, expect the unexpected and anticipate ignorance. I decided to put up my basecamp in the “Test” room today, since this was context-driven testing day: six testing tracks covering a wide variety of topics. The only drawback was that the room looked like it was designed by an architect on acid: unfinished, an enigmatic door way up high in a wall, bare cables and sockets and a very short and high stage that forced you either to stand in front of the projection screen or to stay cemented in the same spot the whole time. Sound isolation was kind of peculiar too, although that only seemed to be a problem when Americans were presenting nextdoors. But I’m nitpicking here: the whole Slagthuset venue was nice, and organization and technical team were super helpful, the whole day. Pradeep Soundararajan‘s talk was titled “How I wish users knew how I help them through context driven testing”. Pradeep started by pointing out that he had the shortest abstract and the longest bio in the conference booklet. True. He seems to like long titles for his talks, too. In combination with his name, this probably makes him a nightmare to introduce at conferences. But in contrast with the title, his talk was short, crisp and funny. He was brave enough to do some live-demoing of his twitter-driven exploratory testing approach: looking for user feedback by searching in tweets with negative emoticons and profanities combined with the product or website name. I hadn’t read his blogpost before now, and it made me laugh out loud. I love the smell of profanities in the morning. Brilliant idea, that. Next up was Shmuel Gershon, who shared an experience report of a 100% exploratory testing project, “Case Study on Team Leadership with Context-Driven Exploratory Tests”. He came well-prepared, all set to win our hearts with charisma, handouts and chocolats. He told us about how he took his team on a journey towards more context-driven testing and how he dealt with that as his role was also changing. He told us a story on test management, session based testing, recruiting even. He urged us to let people tell their stories, don’t start asking why, leaving them feeling that they have to justify themselves. 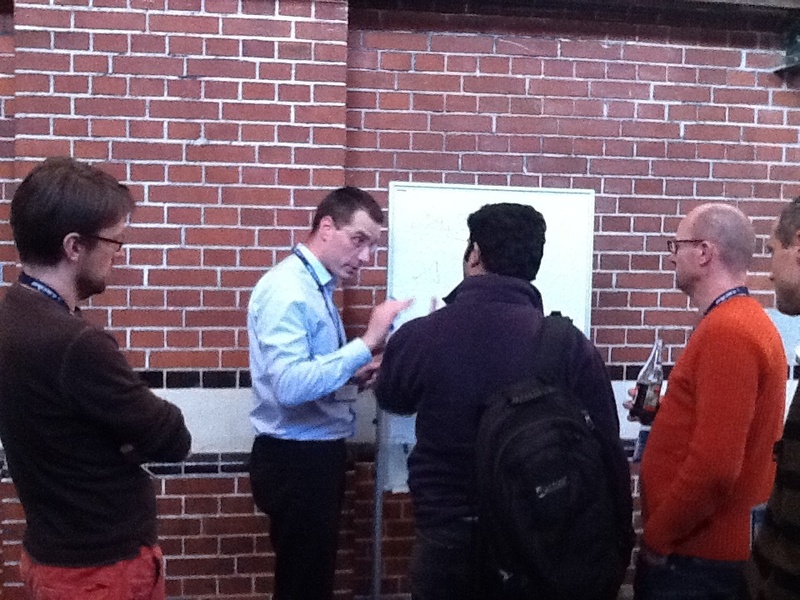 The ubiquitous Gojko Adzic (I suspect there are several clones making the rounds of conferences worldwide. Where /doesn’t/ he speak?) was his energetic self in his graveyard shift session called “Sleeping with the enemy”. Independent testing, he said, should be a thing from the past. Testers should engage with developers and business users, in order to create opportunities to accomplish things they cannot do otherwise. I like Gojko’s style, always direct and uncompromising, but always thoughtful. After Gojko’s presentation, a heated hallway discussion ensued in the so-called chalk-talk area. This embodies what conferences are all about: conferring. With “Diversity in team composition”, Henrik Andersson took the small stage trying to convince us that when assembling good teams, diversity rocks and uniformity, well, not so much. With some simple examples (“can I please ask everyone wearing black clothes to stand up. You are now a team”), he showed us that there’s much more to it than randomly throwing some people together. Then it was Selena Delesie‘s turn to shine in the beamer lights. In “Focusing Testing on Business Needs”, she explained how to focus the testing effort on customer needs. She asked some pertinent questions; Are you valued in your team? How do you know? The last presentation slot of the day in the testing track was for yours truly. 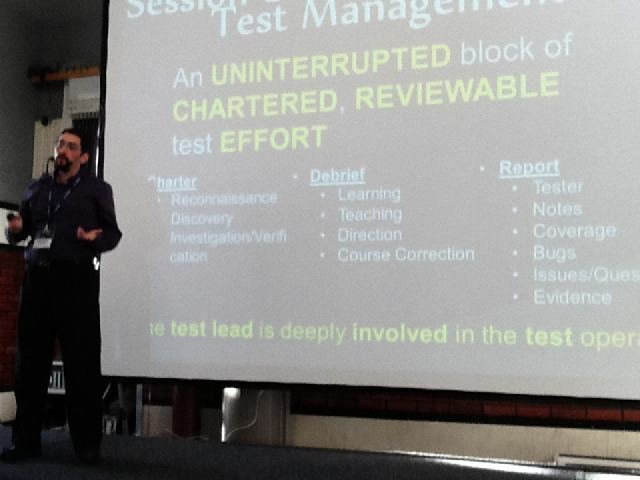 In Artful Testing, I talked about how I think testing can benefit from the arts. From thoughtfully looking at it, to develop our thinking. From critical theory and the tools used by art critics, to become software critics. From artists, and how they look at the world – through artist personas). I also touched on the importance of context in evaluating art and software. I received some great reactions and feedback afterwards, and some good tips from Pradeep and Rikard as well. After that, there was dinner, drinks and Øredev Open, where Pradeep was invited to present “The next generation software tester”. In theory. But you know how these things go. In theory, theory and practice are the same; in practice they are not: dinner took a bit longer than expected, drinks were abundant and so it happened that Pradeep took the stage for some Beer-Driven Exploratory Presenting. It was a great stand-up routine. Ola Hylten joined in and Shmuel decided to whip out his box with tester games and puzzles. Time for some serious thinking, mixed with laughs. When the Øredev Open closed, we took ourselves and our silly games to the hotel bar where innocent passers-by quickened their pace. Day 3 in the test track started with “Agile testing: advanced topics” by Janet Gregory who highlighted five topics that had emerged since the release of “Agile Testing” by Lisa Crispin and herself. She mentioned feature acceptance (when you’re not able to deliver everything, focus on the features that matter), collaborative automation, large organizations, distributed teams, continuous learning. 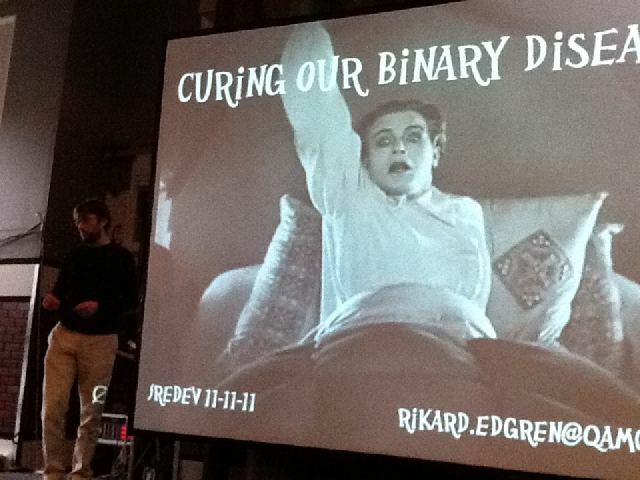 Next up was my favorite Swedish philosopher (granted, I only know one), Rikard Edgren, who delivered did a spot-on and thought-provoking session called “Curing Our Binary Disease”. He stated that software testing is suffering from a binary disease: pass/fail addiction, coverage obsession, metrics tumor and sick test design techniques (sick as in “ill”, not “wicked” – my interpretation). Couldn’t agree more. He also mentioned his infamous “software potato”, which made for following legendary phrase: “A tester might not even know that he’s in the potato”. All this binary goodness got me thinking: Stay/Go? Focus/Defocus? Defocus it was. I chose to do a final round of the expo and do a quick Copenhagen visit to get some fresh air while it was still light out. That concluded Øredev 2011. It was great to finally meet Selena, Sigge and Pradeep. And Robert Bergqvist as well. 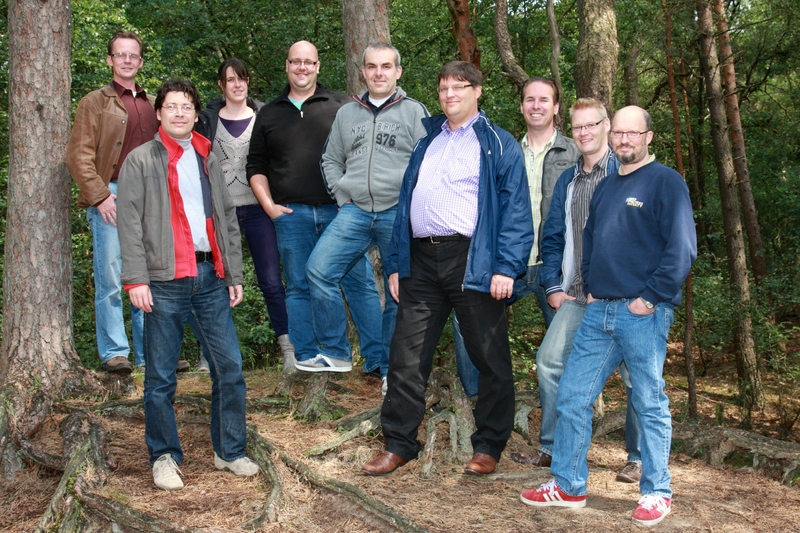 It was great catching up with others (Johanna, Shmuel, Henrik, Janet, David, Ola, Rikard,…). Next up: Eurostar in Manchester next week. A full-blooded tester conference that will rock as well. Let’s meet there.